From 28 May until 27 November 2016, Mexico City’s Museo Universitario Arte Contemporáneo (MUAC), one of the country's most prestigious universities, presents a major exhibition of work by acclaimed international artist Anish Kapoor. The exhibition ‘Archaeology, Biology’ features 23 significant pieces made between 1980 and 2016 and has been organised around four separate themes. The first section, titled 'Auto-Generated Forms' includes early pigment pieces and the artist's signature optical sculptures. The second section, 'Many Kinds of Beauty', features pristine geometrical pieces next to more grotesque and bawdy forms. This section highlights a tension within Kapoor's work between the ideals of purity and the mathematical precision of form; the swelling of When I am Pregnant (1992) and the seamless mirror surface of C-Curve (2007) with the grotesque and the scatological cement extrusions of Ga Gu Ma (2011–12). In the third room, 'Time', the red monochrome dome At the Edge of the World (1998) frames abduction as a means of representing the infinite. The final room, 'Unpredictable Forces', explores the themes of self-generation and fantasies of the autonomous expression of matter through works like My Red Homeland (2003), a churning disc of wax in perpetual motion and state of becoming, and Archaeology and Biology (2007), silicone paintings of a visceral and cannibalistic materiality. 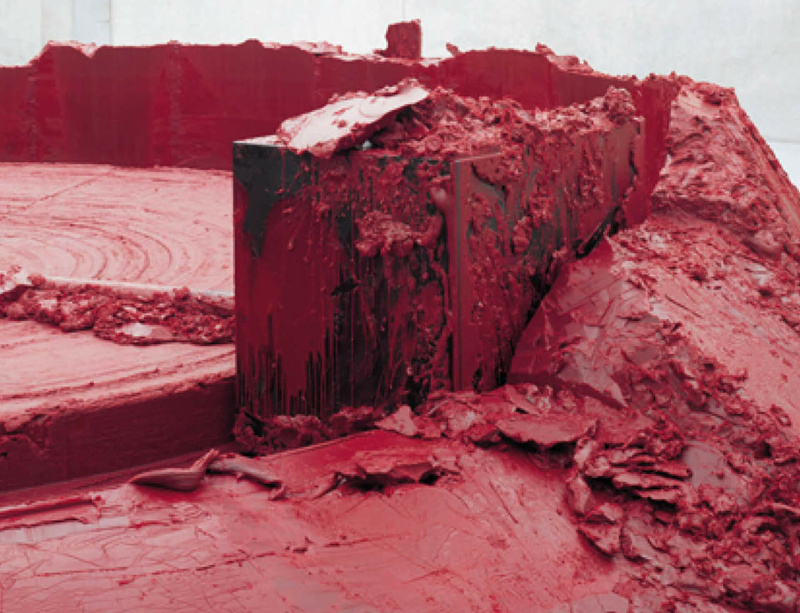 Anish Kapoor states that when the process leads the artist, the work is a discovery. His artistic practice involves a phenomenological approach based on the experience of the creative act, as the artist himself suggests: "I don't have anything to say, but I know that if I immerse myself into the process, it brings me to meanings I could never have imagined." For Catherine Lampert, curator of the exhibition 'Archaeology, Biology', this is a guiding principle of the exhibition in which the work acquires a dimension of its own that involves the viewer, inviting them to experience both the plenitude and freedom of form, as well as the potential space created by the object. As Kapoor states: "So many of the works [...] come to the idea that the space itself is only notionally defined, there is something beyond it. It is a proposition about space treated as a poetic idea."